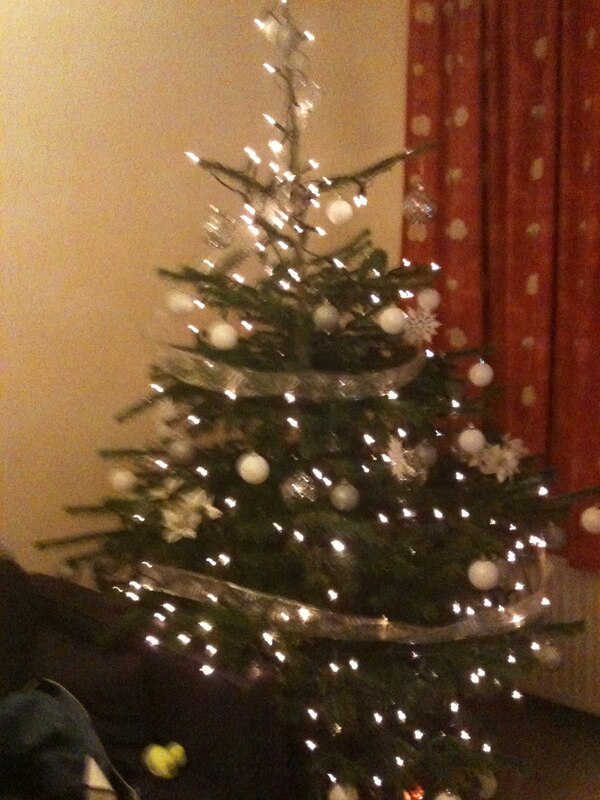 Bird in the Bush - A blog about life in Shepherd's Bush: Rocking around the Christmas tree! I am disappointed to say that this is not a picture of mine and Mo's Christmas tree. 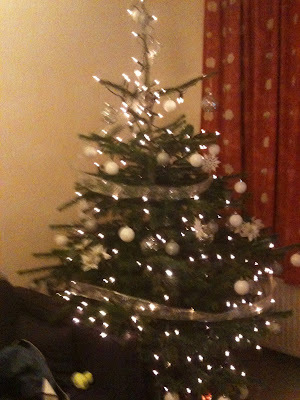 It belongs to my good acquaintance SJ who has been proudly showing it off to anyone with half an ounce of festive spirit. (The picture really doesn't do it justice.) I say "belongs" but actually she has hired it, sort of. For a number of reasons, this year SJ decided she wanted the very literally perfect Christmas tree and I think most people will agree that this doesn't always happen. Like the Christmas tree I will be sat around in 10 days time, most are a mismatch of home-made decorations and thinning tinsel. It's the paper mache ballballs we made in primary school of presents that look like building bricks and the wonky skirted-angel on top of the tree that my brother created which my Mum lovingly dusts down each year and proudly hangs up in full view. SJ's tree wasn't like that; her ballballs match, there is a luxurious lace ribbon instead of tinsel and the tree's branches were a greener green than any fake tree I have seen. Though its' distant cousins are more at home in an American shopping mall, this tree was luxurious, perfectly coordinated and beautiful. I met SJ through the volunteer work I do (as a volunteer reader for visually impaired residents in the borough) and I have been reading to her for just over two years. I enjoy it massively. Yes because I'm doing something worthwhile and getting a weekly dose of all important perspective, blah, blah, blah, but mainly because I get on well with her. She is very different to me in terms of background, age and experience but we have a very similar outlook on life; we are pro-equality liberal thinkers (i.e. borderline feminists with an intentionally suppressed revolutionary streak) and we are both obsessed with nail varnish. SJ didn't chose to have this gorgeous tree delivered to her and then decorated for her (I never knew this service actually existed!) because she is blind, it was because is going to be away and knew she'd be too busy to actually get everything organised in time so it was one less thing to think about. Good for her I say as I haven't even bought the Christmas cards I will send out too late. As it happened the company that provided this tree and the decorations (which she has bought to keep unlike the tree which they take away as part of the service) were specifically accommodating and understanding of her lack of sight so I feel they, Pine and Needles, deserve a mention should any of you be considering this for Christmas 2011. (I anticipate they are all booked up for this year though I don't know for sure). The best bit is they are local to W12 with a mobile stand in Westfield where you can go and pick your tree or make an order. They deliver within a 4 hour time slot, though I must report that they were late delivering to SJ. However rather than a mumbled lacklustre sorry, SJ's compensation was an additional complimentary delivery of holly and mistletoe. Of course SJ paid a healthy price for this luxurious Norwegian spruce and the ballballs which cost more than (but are probably about the same size as) most of my earrings. But getting something a little extra with what you ordered is always a lovely thing to receive, especially at this time of the year. I believe that may be what they call Christmas spirit and I wish you all lots of it Shepherd's Bush!